Asset-building strategies, such as Individual Development Accounts, enable low-income persons to save and invest in long-term assets with return potential. Studies show that participants in Individual Development Accounts experience positive outcomes, such as accelerating the move to homeownership, obtaining safe mortgages, succeeding as homeowners, and avoiding foreclosure. 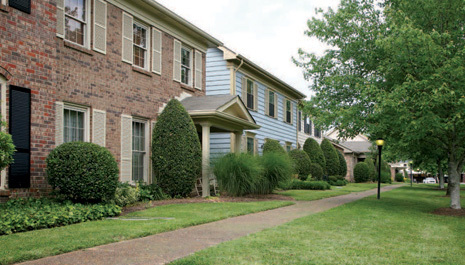 Research suggests that IDA participants are more likely to become homebuyers and tend to be more successful homeowners. Individual Development Accounts(IDAs) emerged in the United States in the 1990s as an asset-building strategy. Although IDA programs vary in design, they all provide matching funds to low-income recipients to promote savings that can be spent later on eligible uses such as higher education, microenterprise, and homeownership. The goal of these programs is to help low-income families save money that they can invest in high-return, long-term assets. 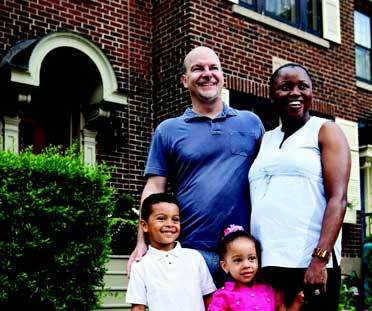 Recent research provides important insight into the success of IDAs as a vehicle for promoting both asset-building and low-income homeownership. As noted in the previous article, homeownership has been a primary means for low-income Americans to build wealth and has been shown to yield positive social outcomes. Evidence suggests that IDAs, when paired with counseling, may promote more sustainable low-income homeownership. This article explores the history of and research underpinning IDAs, both in general and in the homeownership context. Because so many entities sponsor them, IDA programs show significant variation in design characteristics and eligibility requirements. However, most programs share certain key characteristics. Eligibility is typically limited to those whose annual household incomes fall below a certain threshold (often 200 percent of the federal poverty level), and may also require limited net worth and a good credit history.7 Participants are usually enrolled in a program for a period of one to five years, and saved earnings, when withdrawn for eligible uses, are matched at rates that can range from 1:1 (the most common) to as high as 6 matched dollars for every dollar saved. Some programs cap annual and lifetime matches. Matched savings can typically be used to pay for higher education, start a small business, or buy a home, and some programs also allow participants to use matched savings for retirement, home repairs, or work-related car or computer purchases.8 In addition to matching savings, programs also provide general financial counseling, and many offer additional training tailored to the participants’ planned use. Source: "Find an IDA Program Near You," The Corporation for Enterprise Development website (cfed.org/programs/idas/directory_search/). Accessed 19 November 2012. Another critical source of evidence on the effects of IDAs has been the American Dream Demonstration (ADD). Coordinated and funded by the Corporation for Enterprise Development and its philanthropic partners, ADD was composed of 14 program sites nationwide that offered IDAs, each of which was managed by different entities and employed varying program designs and guidelines.12 ADD targeted the working poor, and as with the programs funded by Assets for Independence, its participants were more likely to be female, African American, and single and never married than the low-income population overall. ADD participants were also significantly more educated and more likely to be employed full- or part-time than the average low-income person.13 The outcomes of this group of 2,378 participants have been studied extensively and continue to inform the evolution of IDA program design. But with research on the ADD and other IDA programs, methodology challenges must be considered. Researchers consistently caution that program participants are often recruited by sponsoring organizations and affirmatively choose to participate in an IDA program, which increase the likelihood of consistent differences between program participants and the low-income population as a whole. Although some of this variation in personal characteristics is observable and can be accounted for in statistical analysis, differences in motivation or other unobservable factors may skew results, even in experimental evaluations that randomly assign applicants to either an IDA treatment group or a control group. In addition, many IDA evaluations rely on comparison groups built using data rather than through random sampling; this quasi-experimental design also increases the likelihood of systematic differences between program participants and the low-income population overall. While many articles examining IDAs focus on overall asset-building results, another vein of IDA research has delved into the effects of these programs on specific savings goals, including homeownership. The challenges confronting low-income Americans seeking homeownership opportunities are described throughout this issue of Evidence Matters. Homeownership is associated with a variety of improved outcomes, but it also carries substantial risks, especially for low-income households. As University of Southern California economists Raphael Bostic and Kwan Ok Lee explain, “The current housing environment…is one in which lower-income households can find themselves quite vulnerable to homeownership failure. Our finding that foreclosure rates are elevated in lower-income communities, holding other factors equal, supports the notion that these elevated risks have come to fruition.”22 In their research, Bostic and Lee discover that low-income households who were able to make higher down payments and build equity early derived greater financial benefits from homeownership. They conclude that “[a] clear dimension to be explored is increasing lower-income households’ savings rates. Higher savings would permit these households to make larger down payments, and we have shown that the risks of homeownership difficulties and foreclosure are significantly reduced if homeowners can acquire equity early in their ownership tenure.”23 Research into the outcomes of IDAs used to purchase homes supports the argument that increased savings can yield more sustainable low-income homeownership. Buying a home is the most popular eligible use for IDA matching funds. As research continues to inform IDA policy, successes learned from IDA evaluations are being applied to other initiatives targeting low-income individuals when possible. HUD’s Family Self-Sufficiency (FSS) program is just one example of a program that draws from IDA asset-building strategies. The FSS program helps low-income families who receive housing vouchers build the assets needed to achieve economic self-sufficiency.40, 41 FSS participants meet with case managers who provide training in financial literacy and referrals to supportive services such as childcare and education programs. Each participant receives an escrow account managed by the public housing agency. Rent normally increases as the family’s income rises, but in the FSS program, credits based on increased income are deposited into the family’s escrow account; this savings incentive serves as the equivalent of the matched savings in IDA programs. Graduates from the program receive the total amount banked plus interest. More research on the efficacy of the FSS program is in development. HUD has funded two studies of the program to date, but neither one shows how well families would have done in the absence of the program. The third study, the Family Self-Sufficiency Program Demonstration, will evaluate whether the benefits that FSS participants enjoy (such as increased income and savings, educational attainment, and economic improvement) can be attributed with certainty to the program’s design or to inherent characteristics of the participating families. IDAs remain a comparatively new policy innovation, and research will continue to shape the development of program guidelines and targeting of services. And this research is by no means limited to the United States; case studies on national IDA programs in both developing and developed countries are yielding important findings. One key dimension of this ongoing research is the need to clearly determine which components of IDA interventions most drive improved outcomes for participants. For example, as mentioned previously, research from the ADD shows that financial education correlates with greater savings for the first 12 hours, but because IDA programs consistently require financial education, little evidence exists as to whether IDA programs without a financial education component would succeed at all.43 Such research can help future IDA initiatives create more efficient program designs that tailor to the needs of specific populations. IDAs remain expensive, and not just because of the need to match participant savings. 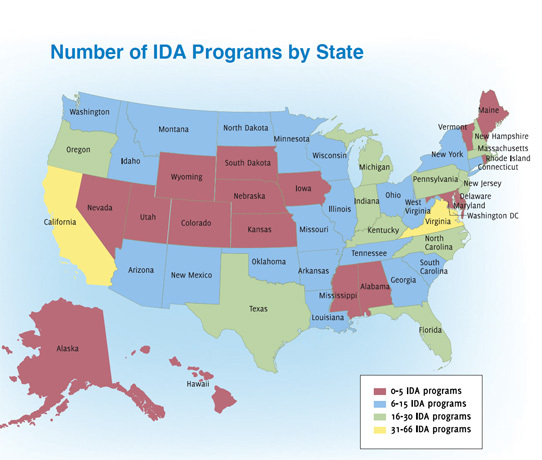 In 2005, IDAs cost about $64 per participant each month to administer, including “recruitment, financial education, monitoring deposits and withdrawals, and providing other high-tech services.”45 And because IDA programs remain relatively small, they often do not achieve economies of scale.46 Ongoing expansions of IDA programs, technical advances, and the efforts of organizations such as the Corporation for Enterprise Development to share best practices have likely helped to lower administrative costs, but obtaining sustainable funding streams that do not rely overly on a single source, such as a federal grant, will remain a critical challenge. With demonstrated success at bolstering rates of higher education, microenterprise, and successful homeownership, IDAs are poised to become an increasingly important approach to supporting wealth-building among low-income Americans. Michael Sherraden. 1991. Assets and the Poor: A New American Welfare Policy, Armonk, NY: M.E. Sharpe, 231. Donna DeMarco, Gregory Mills, and Michelle Ciurea. 2008. “Assets for Independence Act Evaluation, Process Study: Final Report,” U.S. Department of Health and Human Services, 2–3. “Assets for Independence Program Summary,” U.S. Department of Health and Human Services website (www.acf.hhs.gov/programs/ocs/resource/assets-for-independence-program-summary). Accessed 5 November 2012. “AFI Grantees.” Assets for Independence Resource Center website (idaresources.org/afigrantees). Accessed 5 November 2012. “IDA Directory.” Corporation for Enterprise Development website (cfed.org/programs/idas/directory_search/). Accessed 5 November 2012. DeMarco, Mills, and Ciurea, 3. Corporation for Enterprise Development. 2009. "Individual Development Accounts (IDAs)." Gregory Mills, Ken Lam, Donna DeMarco, Christopher Rodger, and Bulbul Kaul. 2008. “Assets for Independence Act Evaluation, Impact Study: Final Report,” U.S. Department of Health and Human Services, iv. Michal Grinstein-Weiss, Michael Sherraden, William M. Rohe, William Gale, Mark Schreiner, and Clinton Key. 2012. “Long-Term Follow-up of Individual Development Accounts: Evidence From the ADD Experiment,” v.
Michael Sherraden, Mark Schreiner, and Sondra Beverly. 2003. “Income, Institutions, and Saving Performance in Individual Development Accounts,” Economic Development Quarterly 17:95, 99–100. Michal Grinstein-Weiss, Yeong H. Yeo, Mathieu R. Despard, Adriance M. Casalotti, and Min Zhan. 2010. “Does Prior Banking Experience Matter? Difference of the Banked and Unbanked in Individual Development Accounts,” Journal of Family and Economic Issues 31:2, 220. Mark Schreiner and Michal Sherraden. 2005. “Drop-Out From Individual Development Accounts: Prediction and Prevention,” Financial Services Review 14:4, 48. Raphael Bostic and Kwan Ok Lee. 2009. “Homeownership: America’s Dream?” In Rebecca Blank and Michael Barr, eds., 2009. Insufficient Funds: Savings, Assets, Credit, and Banking Among Low-Income Households, New York: Russell Sage Foundation, 244. Ray Boshara. 2005. “Individual Development Accounts: Policies To Build Savings and Assets for the Poor.” Brookings Institution Policy Brief: Welfare Reform and Beyond 32, 6. Roslyn Russell. 2008. “Saver Plus: More Than Saving — A Brief Comparison With International Programs,” Melbourne, Australia: RMIT University, 3. Ida Rademacher, Kasey Wiedrich, Signe-Mary McKernan, Caroline Ratcliffe, and Megan Gallagher. 2010. “Weathering the Storm: Have IDAs Helped Low-Income Homebuyers Avoid Foreclosure?” Washington, DC: Urban Institute, 1. Michal Grinstein-Weiss, Jung-Sook Lee, Johanna K. P. Greeson, Chang-Keun Han, Yeong H. Yeo, and Kate Irish. 2008. “Fostering Low-Income Homeownership Through Individual Development Accounts: A Longitudinal, Randomized Experiment,” Housing Policy Debate 19:4, 720–21. Grinstein-Weiss, Sherraden et al., 46. Christopher E. Herbert and Winnie Tsen. 2005. “The Potential of Downpayment Assistance for Increasing Homeownership Among Minority and Low-Income Households,” U.S. Department of Housing and Urban Development, Office of Policy Development and Research. U.S. Department of Housing and Urban Development, Community Planning and Development. 2008. “Use of Community Development Block Grant (CDBG) Program Funds in Support of Housing,” Notice CPD-07-08. Lalith de Silva and Imesh Wijewardena. 2011. “Evaluation of the Family Self-Sufficiency Program,” U.S. Department of Housing and Urban Development, Office of Policy Development and Research. Also see Evaluation of the Family Self-Sufficiency Program: Retrospective Analysis, 1996 to 2000. Margaret Clancy, Michal Grinstein-Wiess, and Mark Shreiner. 2001. “Financial Education and Savings Outcomes in Individual Development Accounts,” Working Paper HEW 0108001, EconWPA, 1, 7. DeMarco, Mills, and Ciurea, iv.